So today I was heading to get a pizza on lunch break . I'm barely out of the parking lot and heading down the street when it caught my eye . I'm talking to my wife on the phone when I abruptly stop the conversation and say " Did I just see a record on the side of the road !!??). To which my wife replies ..."what ? ". 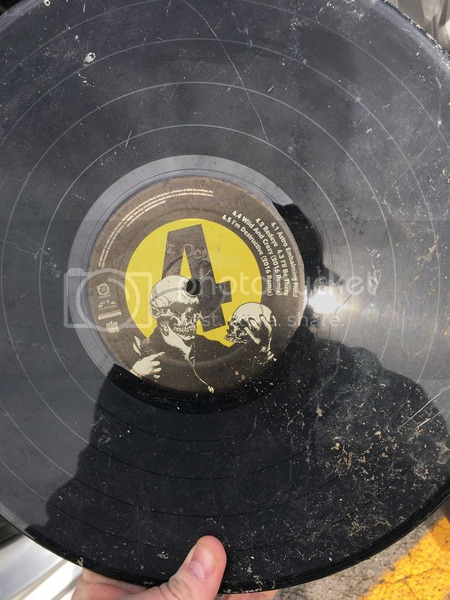 I said I think I just saw a record on the side of the road . Me being me , had to turn the car around and look and there it was .. This dirty , warped , scratched 2nd lp from the Dr. Octagon 20th anniversary box set . Me being me again threw it in the car . Although only small portions of the record are still playable (and I'm talking pizza slice portions not full circle grooves) I still had to bring it home to show off . This is the first time I've ever found a record on the side of the road and I imagine it may be my last . Although I have found some other thing on the side of the road , anybody else ever find anything worth mentioning ? That's the perfect candidate record for a beer coaster. Find a hole saw, mount it to your drill, court out the label, spat with lacquer, glee cork to the bottom, and that's the coolest coaster ever. If is unplayable, why not? All I've ever found on the sides of the road is miles of cassette tape unwound.